Space is not a neutral and passive geometry. Space is produced and reproduced and this represents a site of struggle. 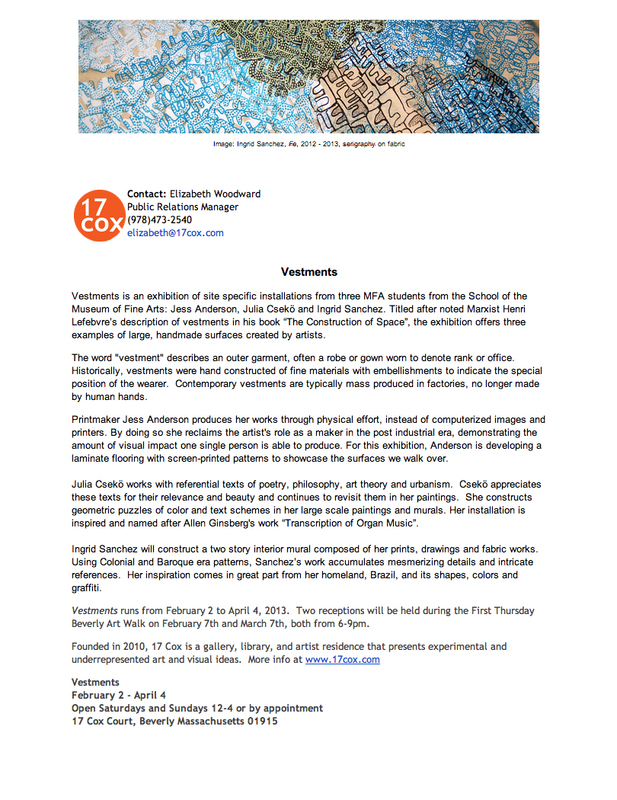 Vestments is an exhibition of site specific installations from three MFA students at the School of the Museum of Fine Arts: Jess Anderson, Julia Csekö and Ingrid de Aguiar Sanchez. 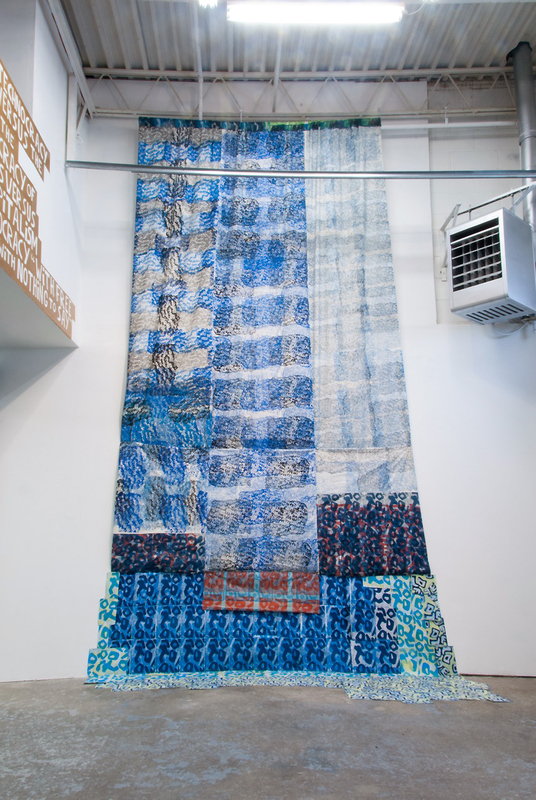 Titled after noted Henri Lefebvre’s description of "vestments" in his treatise on the social construction of space, "The Production of Space" (1974), the exhibition offers three examples of large hand made surfaces. For Lefebvre, a "vestment" is a shroud or an attempt to conceal a structure's true identity through its outer surface, in doing so, the surface becomes a subject matter of its own. Traditionally, artists use surface as a passage into their work, to reveal the inner qualities of their subjects, through metaphorical qualities of ornamentation and texture, or the connotations of different material surfaces. For Anderson, Csekö and de Aguiar Sanchez, the surface is used to disguise or postpone awareness of the subject. Anderson’s faux wood is deceitful, its silkscreened wood grain patterns distract rather than describe. De Aguiar Sanchez’s collage is impactful, implying volume and chaos while it is nonetheless flat and rigidly patterned. 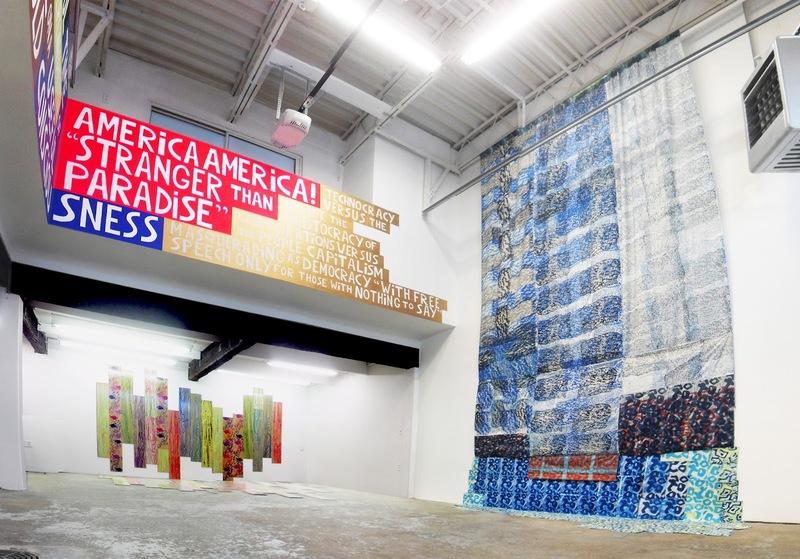 Csekö’s mural of Lawrence Ferlinghetti's work “Time of Useful Consciousness” is comprised of singular blocks of text so emboldened with color that they frustrate a linear reading of the whole. Jess Anderson received her BFA in Sculpture and Painting from Washington State University (Pullman WA) and will receive her MFA from the School of the Museum of Fine Arts (Boston MA) in 2013. Anderson has exhibited at Mission Hill Gallery, SMFA (Boston MA), Laurel Gallery (Ventura CA) and Gallery III, WSU (Pullman WA). Julia Csekö received her BFA in Sculpture from the Federal University of (Rio de Janeiro Brazil) and will receive her MFA from the School of the Museum of Fine Arts (Boston MA) in 2013. Csekö has exhibited internationally, recent exhibitions include Galleria Oscar Cruz (São Paulo, Brazil), TAC Gallery (Rio de Janeiro Brazil), Emerson College Gallery (Boston MA) and the British Columbia University Museum, (Vancouver Canada). Ingrid de Aguiar Sanchez received her BFA from The Maryland Institute College of Art (Baltimore MD) in 2006 and her MFA from School of the Museum of Fine Arts (Boston MA) in 2011. 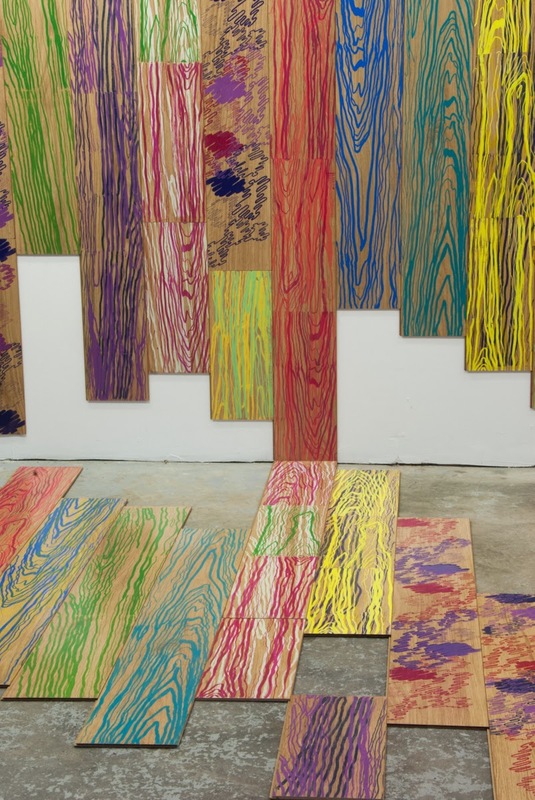 Recent group exhibitions include David Rockefeller Center for Latin American Studies, Harvard University (Boston MA) US Interests Section, (Havana, Cuba), NK Gallery (Boston MA) and Boston Young Contemporaries.